In my second author feature of the day, I’m very pleased to welcome Fiona Ford who is sharing #TenThings she’d like her readers to know about her. 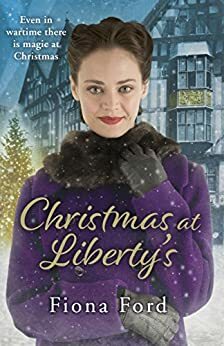 Her latest novel, Christmas at Liberty’s takes us back to that famous London department store during the Second World War. Over to Fiona to tell us more. I am very proud of the fact that I was born in Cornwall and come from a long line of Cornish ancestors. Sadly a lack of work in the seventies meant we as a family had to move away and so I grew up in Bath and had to settle for frequent holidays in Cornwall instead. However, even though I now live in Berkshire I always try to sneak in a reference to the West Country in my books where possible – it makes me feel like I’m going home. I haven’t always been a novelist, I started out as a journalist working for the local papers then I moved up to London to work for the nationals and women’s magazines. I got mugged by a three-year-old in Camden the first day I moved to the city – true fact! From the moment I moved to London I had a soft spot for Liberty’s the subject of my new book. An old friend of my dad’s used to run a concession in the store and regularly told us all tales of how beautiful the store was and how it was a world like no other. The idea for the new book came when I saw a plaque on the staircase of Liberty’s while I was browsing one day. It was dedicated to all the staff who had died in the war and I started to wonder what on earth it would have been like to work somewhere so unique and sumptuous while the bombs began to fall. When I’m not writing I’m quite into health and fitness. I’ve run two half marathons – the last one I ran with what I thought was a pulled muscle. In actual fact it was an umbilical hernia and I needed emergency surgery after the race! These days I’m more into sedate exercise as I quite like staying away from hospital. There’s no such thing as a typical writing day – I write anywhere and everywhere, and frequently do. After writing two books about female drivers in the war (The Spark Girl and A Wartime Promise) I thought it was high time I passed my driving test myself this year. And so at the tender age of 41 I finally passed my test with zero faults. I should also say three months after passing I’m terrified behind the wheel of my wonderful new Toyota Yaris. I’m convinced I don’t know what I’m doing, so if you see me be kind – I still think the examiner made a mistake. Like many I support the #MeToo movement. But one thing I’d like to call out is female bullying. I was bullied twice during my journalism career, each time by another, more senior female. To this day I have never understood why women do this to other women, when it’s always been clear to me we should be helping each other rise up, rather than trying to keep each other down – its not just sad it needs to stop. Something I’m most proud of is working my way around America as a freelance journalist. I didn’t just get to know a country, I got to know myself, met some incredible people, uncovered some fantastic stories and paid for my travels all at the same time, it was an amazing experience. September, 1941: Mary arrives in war-torn London nursing a broken heart and a painful secret. When she is offered her dream post as an assistant in the fabric department at Liberty store, she knows this is the fresh start she needs. Amid the store’s vibrant prints and sumptuous interiors, Mary finds a new family who can help her to heal. But not everyone will give Mary such a warm welcome, and the trauma of her past will soon catch up with her. As Mary and the Liberty Girls endure the heartache and uncertainty of war, it will take a steady heart to keep the magic of Christmas alive. Fiona Ford is the author of the Liberty Girls series, which is set in London during the Second World War.Fiona spent many years as a journalist writing for women’s weekly and monthly magazines. She has written two novels under the pseudonym, Fiona Harrison, as well as two sagas in her own name in the Spark Girls series. Fiona lives in Berkshire with her husband and two cats.